This flock of European starlings flying by the Bent one recent stormy dusk, might also be referred to as a "murmuration", should you have a particularly poetic or literary bent inclination. My friend, the County Clerk, told me so, and more. But he didn't tell me why. It seems these birds have considerable vocalizing prowess. They don't have a particularly tuneful song of their own. But they manage to enhance their own clicking and shrieking with the songs of other birds, or, well, Belltown car alarms. Clever. 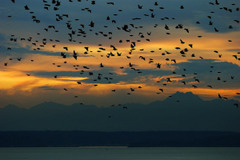 But folks had observed this hundreds of years before these birds shared the horizon with the Olympic Mountains, or any horizon on this continent, for that matter. In 1784, about the time he was writing his Piano Concerto in G major, K 453, Mozart purchased a starling for a pet. Much to his pleasure, the bird learned to sing the Concerto's theme, although it has been said it tended to sharpen all the G naturals. Nearly 200 years earlier, Shakespeare (who often cast birds in his plays) wrote a bit part for a starling in Henry IV, Part 1, Act 3 in which hot-headed Hotspur, forbidden by Henry to speak of Mortimer, threatens to train a starling to repeatedly murmur nothing but the man's name just to torque the King. And that, folks, is all he needed to write. Three hundred years, and countless thousands of performances of the play, later, it's 1890 in New York City's Central Park. An eccentric drug manufacturer and Shakespeare fan, Eugene Schieffelin, on a mission to introduce every old world bird the bard ever mentioned into the United States, releases 60 imported European starlings. The birds, unnaturally (and ironically) enough, took up residence in the eaves of the Museum of Natural History. The "murmuration" quickly outgrew the building, the park, and the state. They crossed the Mississippi by 1928, reached the west coast by 1942, and by the mid-80's some 200,000,000 starlings occupied every state but Hawaii. This proliferation, some would say invasion, has caused many to mutter, much less murmur, some pretty nasty things about starlings. Farmers in particular, although I doubt they share Henry's disdain of Mortimer. I kind of like them, but I'm just a bent Belltowner watching them fly by the mountains. You can decide, or not, for yourself. I'm glad you mentioned the starlings. On Wednesday evening, just after sunset, I was walking on Pine between 3rd and 4th, when suddenly there was the most incredible racket and commotion. I looked up an couldn't believe how many hundreds, thousands? of starlings were flying around from tree top to tree top, on wires, on buildings. The tops of the yellow leaved maples (are those maples there?) were black with them. I mentioned to a woman standing next to me at the intersection that it was like the movie The Birds, and she remarked that last year the exact same thing happened - this congregation of starlings. It was such an unusual sight that I had to just stand there for awhile.